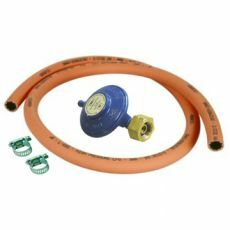 Calor Butane 4.5kg Gas Regulator with Hose. Butane 4.5 kg camping gas regulator. 1 metre BS rubber hose. Allows connection of your appliance to the butane 4.5 kg gas cylinder. Fits all calor gas type 4.5 kg gas bottles.